Profile: Chromedome spent several thousand years crunching numbers at Cybertron's Institute for Higher Programming before a Decepticon attack reduced it to a smoking pile of microchips. Forcibly dragged into the war in this way, Chromedome turned his skills to limiting the potential for violence by reprogramming many of his Autobot colleagues to be able to outsmart their foes. But this only began an ever escalating strategic brain race during which each side furiously competed to apply the latest in software to military purposes. Disillusioned and frustrated, Chromedome eagerly joined Fortress Maximus's expedition in search of a peaceful world upon which to live. Although, much to his chagrin, the war soon followed him to Nebulos, Chromedome still devotes much of his time to academic pursuits - after all, he now has a whole new world to learn about. But he is also now resigned to the idea that the war with the Decepticons can not be avoided, only won. He's as scholarly and reserved as he ever was, but now he's also a stalwart warrior. Stylor, Chromedome's binary-bonded Nebulan partner, is more concerned with appearance than warfare. He spends more time primping himself and polishing Chromedome than he does preparing for battle. In Nebulan society circles, he is renowned for his exquisite taste in clothes and dashing good looks. He is not much of a ladies' man, however - few Nebulan women are interested in a guy who tries to look prettier than they do. He's charming, cheery and egotistical. Many suspect the reason Stylor volunteered to become a Headmaster was because it was the fashionable thing to do at the time. Abilities: In car mode, Chromedome's twin fuel-injected, turbo-charged, side-mounted engines give him a maximum speed of 478 mph on a flat road. His range is 630 miles. His hood-mounted infrared rangefinder automatically targets his roof-mounted dual lasers, which he also uses in robot mode. Weaknesses: Chromedome does not travel well on rough surfaces in car mode. 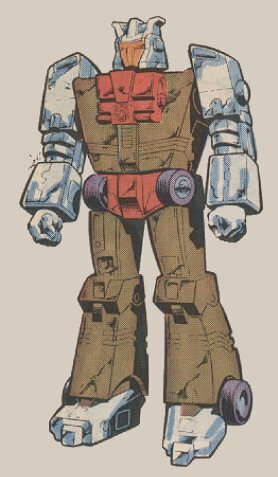 Stylor's preoccupations with himself often impede Chromedome's effectiveness, particularly during combat.